Flexible without plasticizers, heat and cold resistant, skin-friendly, water-repellent but permeable to water vapor: Silicones offer characteristics that cannot be fulfilled by any other plastics. In many industrial branches, these innovative materials are used for diverse products. The most important types of silicones are silicone elastomers, silicone oils, and silicone resins. Application areas are construction, automotive, electrical and electronics, medical technology, cosmetics, textiles, and paper. Ceresana examined the global silicone market already for the third time: Global revenues amounted to over USD 16.3 billion in 2017. Ceresana expects the silicone market to increase further by 3.9% p.a. until 2025. A large part of the global production and revenues of silicones is accounted for by silicone elastomers which are, for example, used in seals, electrical insulations or baking tins. A distinction is made between solid and liquid silicone rubber. In regard to silicone elastomers, the highest revenues are generated in the region Asia-Pacific. In Western Europe and North America, revenues generated with elastomers are slightly higher than revenues generated with silicone oils. Silicone resins that are for example used for paints and coatings have so far been accounting for a much smaller market share in all regions, but are likely to develop at sound growth rates in the future. The region Asia-Pacific is, by far, the major producer of silicones worldwide. Ceresana expects the production in this region to continue to grow. Western Europe accounts for the second highest production figures, while silicone market size in North America is slightly lower. Asia-Pacific, China in particular, is also the largest consumer of silicones. The gap to the second and third largest sales markets, Western Europe and North America, is likely to continue to widen in the future. Yet, established industrialized countries report a higher market value compared to silicone demand, as China tends to consume cheaper products instead of high-end specialty silicones. Chapter 1 provides a description and analysis of the global silicone market, including forecasts up to 2025: demand (in tonnes), revenues per product type, total revenues, and production volume are explained for each region of the world. 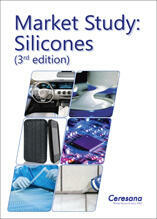 This chapter also includes a concise and precise summary of the most important facts regarding production and characteristics of silicones and individual product types.